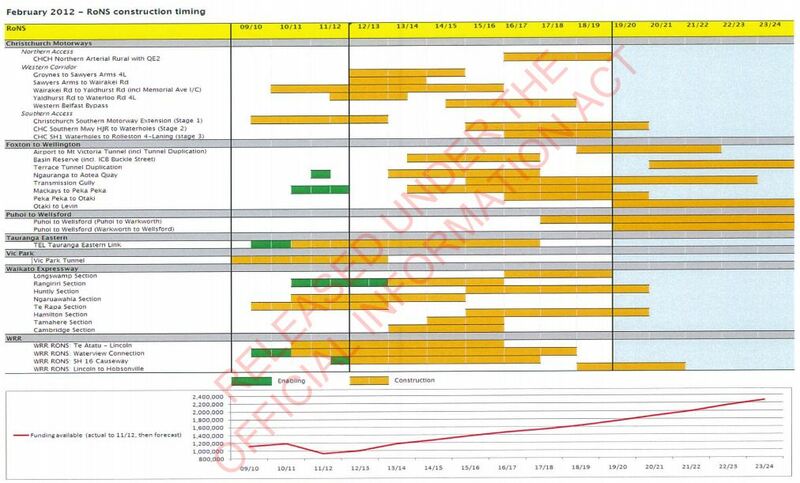 A couple of further documents relating to the Roads of National Stupidity Significance, prepared by NZTA, provide a bit more information on where each of the projects are at. There’s also a good Radio New Zealand piece on the documents, in which both Phil Twyford and Julie-Anne Genter (Labour and Greens transport spokespeople) highlight their fundamental concerns with the RoNS package, whether they’ll actually be able to be funded, whether they’re value for money and so on. Having a cost-benefit ratio for the whole entire RoNS package is pretty pointless. We know that some of the projects stack up pretty well (Victoria Park Tunnel, Western Ring Route) whereas others are a complete waste of money (Puhoi-Wellsford and much of the Wellington Corridor). Having a BCR for the whole package completely hides the fact that many parts of it quite simply shouldn’t be built. It is interesting that NZTA are arguing for a lower discount rate for the RoNS projects, when the single project that would benefit most from the lower discount rate approach would be the City Rail Link, due to rail projects have extremely long-lasting benefits. Central government agencies might find themselves in the hilarious position soon of making the CRL project stack up really well if they align its discount rate with the RoNS projects – oh what a wonderful irony that would be! It is also interesting to learn that NZTA will be undertaking a complete review of the economic analysis of the RoNS programme over the next few months. I might have to start warming up my OIA requests for all that work pretty soon! The hilariously depressing next part of note are the future RoNS the government added in through last year’s Government Policy Statement. The Cambridge to Taupo motorway idea must be the craziest transport idea ever seriously thought up – much of that section of State Highway 1 has traffic volumes much lower than pretty much every arterial road around Auckland. Furthermore, the addition of further RoNS undermines the government’s latest argument – that once the RoNS are complete they’ll get back to doing things like maintaining local roads properly. Finally, the report notes (and this was picked up on by the Radio NZ piece) that some of the RoNS projects will be pushed out to completion a few years after 2020. Looking at that list, it does make one wonder whether NZTA are holding out for a change of government so they can cancel the most stupid of the projects: The second document provides relatively similar information. The one thing of interest that stood out to me related to the impact of the RoNS package on general state highway funding and the proportion of the state highways funding class which gets eaten up by the RoNS: In “NZTA speak”, what this actually means is that a whole pile of more worthy, smaller projects, aren’t being funded because the RoNS are eating up the transport budget. And here is the construction timeframes for the various RoNS projects. With a change of government in 2014 looking increasingly likely, it’ll be interesting to see how much of this pointless RoNS package actually gets built. It could be that if any of the projects are delayed by a few years, they could end up not happening at all – thankfully! Point number 32 says that based on current funding models it will be 23/24. I don’t believe this is true, as 6 out of 7 RONS will be finished by 20/21 with the exception of the Wellington corridor (inner city part). The RONS program funding has come at the expense of funding public transport. One issue I have is if anyone wants a public road or motorway it’s fully funded by NZTA but if people want rail then it’s only 1/2 funded and the wait is much longer / have to go through so many hoops. Case in point airport line in auckland. Cost upwards of 1.5 to 2.0B dollars. Wait – 30 years. Wellington corridor, over 2B dollars, wait time less than 10 years. Keep in mind this all dates back to 2012, before they moved to the PPP funding model for Transmission Gully and Puhoi to Warkworth, which allowed them to raid the future funding available in the next 25 years of the NLTP rather than pay for it from current funding.